Inder Loves Folk Art: Everyday basics. I'm constantly sewing stuff for my kids, and the thought does cross my mind: Why don't I have more skirts and pants with an elastic waist? I mean, seriously! So. Um. Look guys! I made myself a basic blue skirt! 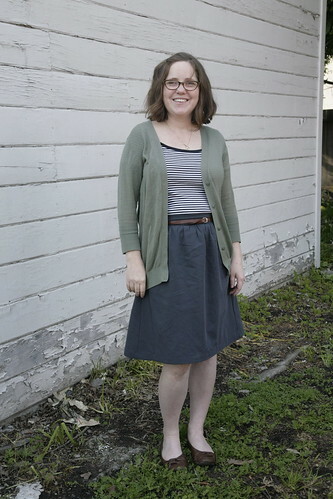 Yep, you guessed it - it's Liesl's Everyday Skirt - a simple gathered skirt with a flat-front waistband and elastic back. So I have to admit, I'm seriously struggling to come up with anything clever to say about this skirt. It's kind of basic! But luckily for me, Carolyn pretty much wrote today's post for me here. Let me summarize: Sometimes "a little boring" equals "a cute work-appropriate item I will wear all the time!" That is the case with the Everday Skirt. It is comfortable and fits perfectly into my day-to-day life. Let's see ... sewing details ... this was an easy sew. The instructions are so very Liesl. If you sew a lot of Oliver + s patterns you know what I mean. 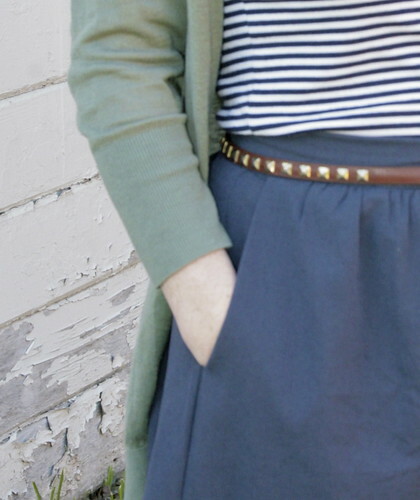 The pockets and side panels on this skirt reminded me of the Afterschool Pants, and the back elastic treatment reminded me of the Sailboat Skirt. It was all explained extremely well, and the finishings are very nice. It felt very familiar and comfortable, sewing up this skirt. 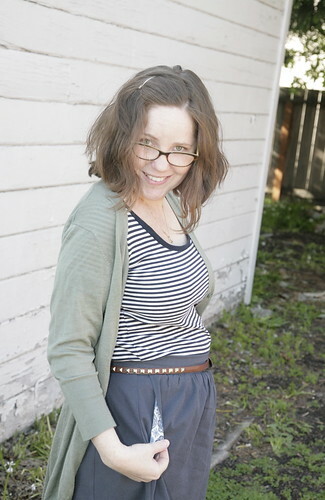 While this skirt was designed to sit on the lower waist, I opted to wear it on my natural waist, so I could belt it. It looks great with most of my belts, by the way. Based on what I read on other blogs, I decided to sew it up in a smaller size than my measurements. This is a medium, and I'm happy with the fit - I'm glad I didn't go with a larger size. If you are wondering about what size you should cut in this pattern, I definitely suggest comparing the "extended waist" actual measurements that Liesl provides to your hip measurement. My waist measurement calls for an XL but my hips are on the narrower side, so the M works fine. This is a really adjustable waistline, and you'd be better off erring on the small side, I think. There is a good amount of ease built into this pattern. The fabric I used is a rayon/cotton blend twill that I found at my local independently owned fabric shop, Piedmont Fabrics. Such a lovely weight and perfectly drapey. I was hoping that it wouldn't be too wrinkly, but, after washing it ... um, er ... I think it's pretty wrinkly. Luckily, I like the rumply look. The color isn't quite navy - it's a lovely gray-blue, just the color I can never seem to get enough of. 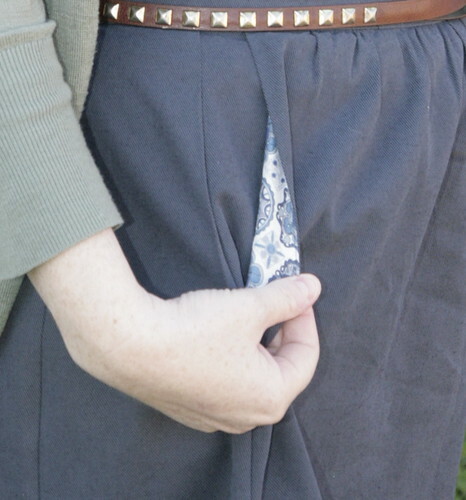 Being an "Everyday Skirt," of course it has pockets. Deep, useful pockets. Which, naturally, I lined in a scrap of voile from the stash. It's hard for me to resist any opportunity to spice up a garment (and use scraps) with a little special touch. So that's the Everyday Skirt! Truly an everyday basic that I will get a lot of wear from. With elastic, baby. So comfortable! Thank you!! I didn't find it as flattering on the low waist for me - I like it on my natural waist. And I could probably go down to an S, even! High five for basics that will actually be worn instead of lingering in the closet (I have a few of those...). It looks great on you, Inder! Great fit and length! Fantastic! As usual, I'm following right behind you, Carolyn! I read your post, and I'm like, hey, that's exactly what I want to say on MY post! Please accept this as flattery, not copyright violation. Hehe! I love it, Inder! 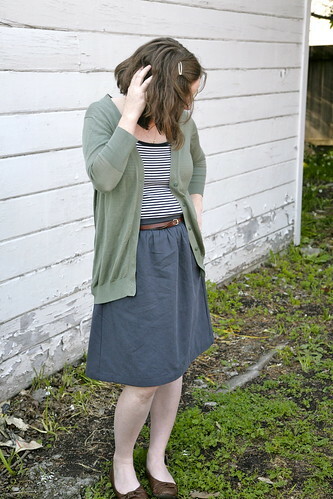 This entire outfit is pretty much my everyday style - skirt + tshirt + cardigan (in the cooler months). It looks great on you! I love these photos of you so much! Yep, me too! That right there is my daily uniform. 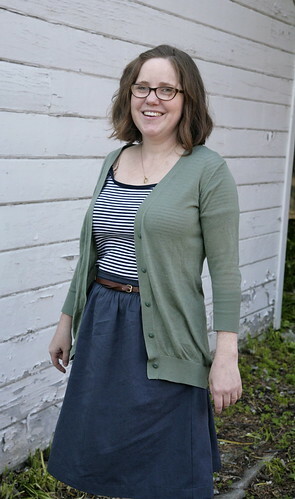 Skirt, top/blouse, cardigan/jacket. It can go from casual to formal enough for court, and it suits me very well. I'm wearing a variation on the theme as I write this! And thanks, I thought the photos were a little goofy, but hey, that's what I look like! I'm a little goofy! What a great skirt! Maybe I'll try a skirt for spring/summer wear. I'm trying to branch out from my fleece and yoga pants daily look :) And if you find any fabric that's good for skirts and pants and such that doesn't wrinkle, please share!